Scientists in China have successfully developed a method of connectivity known as Li-Fi, which allows data to be transferred via light, rather than the traditional radio frequencies. The new development has been spoken about by scientists since 2011, but until now the technology had never been advanced enough to be used for internet connections on a large scale. Thanks to developments made by a team of scientists from the Shanghai Institute of Technical Physics and the Chinese Academy of Scientists, Li-Fi connectivity has made very significant advancements in recent months. Thanks to these new advancements, four computers can be connected to the internet through a single LED bulb, which will allow data to be transferred via light waves. During the China International Industry Fair which kicks off in Shanghai on November 5, there will be 10 sample Li-Fi kits on display to the public. Li-Fi could be a huge boost to the Chinese internet community, which is the highest in the world with around 600 million connections in total. 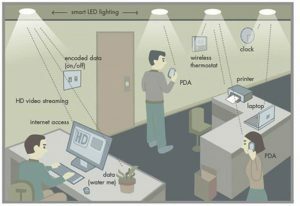 Although Li-Fi internet could potentially be available at a cost-effective price wherever an LED it lit, there are a few disadvantages to the new connection too. Unlike sound waves, light cannot penetrate walls, and could be cut off by a large enough barrier or even just a closed door. Currently it is unclear how fast the a connection via Li-Fi will be, though it is estimated at a potential 150 megabits per second, which is faster than the average internet speed in China.